The sign is nondescript and small. For my nine-year-old son, it is the first tantalizing hint of what lies ahead. “Way to Massacre Place,” it declares, an arrow pointing right, followed a few meters beyond by “Location of Royal Palace Massacre,” in case somehow visitors manage to deviate from the one-way path guarded by an armed soldier. Personally, I was already having an Alice-down-the-rabbit-hole moment. This was my second visit – a palace massacre recidivist – scribbling notes on a wrinkled sheet of paper, as all visitors have to surrender their bags, their cameras and their phones before entering. In Nepal, an absolute monarchy not that long ago, the 2001 royal massacre is the stuff of legends. 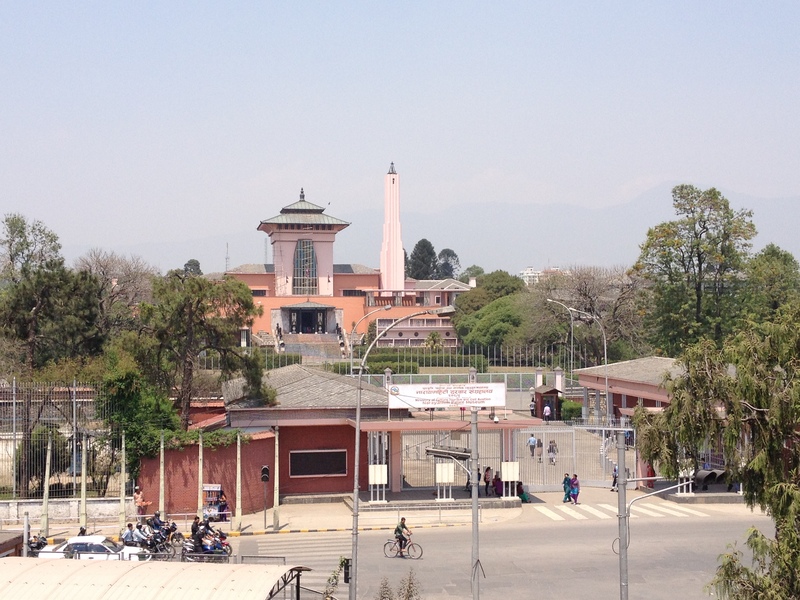 A large crowd of Nepalis queue regularly in front of the elegant metal gate of the Narayanhiti Palace, now a museum, but until 2001 the primary residence of Nepal’s kings. It does not seem to have the same magnetism for foreign tourists, even though it is walking distance from Thamel, the humming hub for all things touristy. 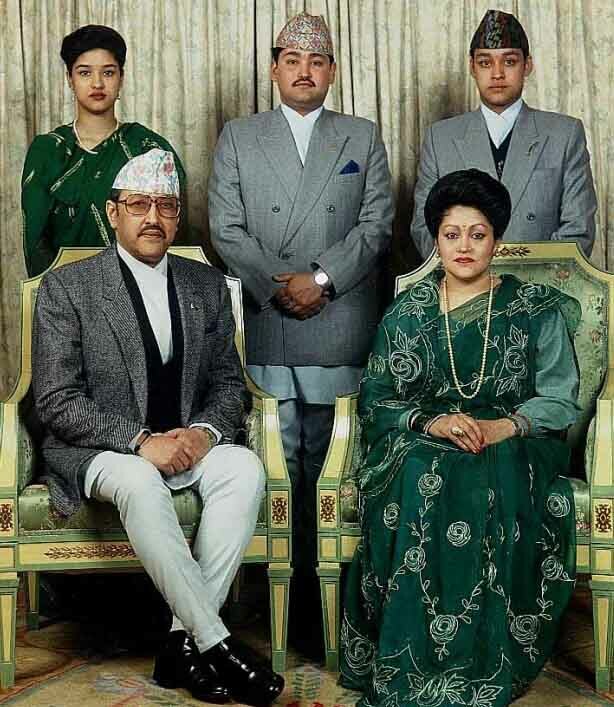 On June 1, 2001 (according to the official version), King Birendra Bir Bikram Shah Dev, 55, considered to be an incarnation of Lord Vishnu, was gunned down during a family dinner party here by his 30-year-old son, Crown Prince Dipendra. In swift succession, Dipendra, dressed in camouflage and armed with an M-16 and a collection of various deadly automatic weapons, killed nine family members, including his mother, brother and sister. He then turned the gun on himself. He lived long enough after he shot himself to be declared king–but as he lay dying the 240-year-old monarchy was dying as well. In 2008, Birendra’s brother and Dipendra’s successor, abdicated, and Nepal became the newest democracy on the South Asian block. But in many ways, the massacre and its aftermath, coupled with an ever-growing plethora of conspiracy theories, remains an emblem of the ethnic and political complexities, traditions, superstitions, conflicts and distrust that pervades today’s Nepali society. To get to the massacre signs, you first walk through a collection of meeting rooms and bedrooms frozen in a 1970s décor, part ski chalet, part genteelly-rundown villa. Stuffed dusty tigers, lions, stag heads, paintings of former kings, elephant feet used as footstools, antelope-hoof candleholders, a gigantic Gharial crocodile nailed to a wall. The portrait hallway has the Nepali King and Queen posing with various international visitors, such as Marshal Josip Broz Tito, Zia ul Haq, Nicolae Ceausescu, Francois Mitterand , and some of lesser fame such as the president of the Swiss Federation. The bookshelves in other rooms mix biographies of the Dalai Lama with classics such as Lord Jim and Kitty Kelley’s The Royals. White mothballs decorate the carpets and chairs and, whether it’s to ward off the densely humid monsoon weather or to mummify time, every room greets me with the pervasive smell of naphthalene. On the ill-fated evening of the massacre, Eton-educated Dipendra was hosting his extended family. Dipendra (known widely as ‘Dippy’) had issues, according to published reports. He drank hard, loved hashish, liked to torture animals and watch them die, and didn’t get along with his mother Queen Aishwarya, who disapproved of the woman he wanted to marry. His bedroom closet was stocked with a vast array of weaponry and ammunition. Survivors described him as single-mindedly going after his victims one by one and even leaving the room to switch weapons. He shot his mother and brother in the garden before killing himself. You can see re-enactments on YouTube. The Western world had the Empiricists, the Rationalists, the Scholastics, the Logical Positivists, the Imperialists. In the U.S. we added the Survivalists who believe that black United Nations helicopters will invade America. Post-massacre Nepal gave an orchestra seat to the Bollywoodists. The initial palace reaction was a public relations disaster, a critical weakness that only enhanced the belief that they were disconnected from life outside their gate. The official statement said a gun had accidentally misfired, killing the king. Dipendra, then in a coma, was named king, and held that position for three days. Subsequently, the building where the shooting took place was razed and the victims cremated, without any autopsies. Later, an official inquiry, headed by the chief justice and one other Nepali, produced a 200-page report that identified Dipendra as the gunman but left many unanswered questions. While the masses outside the gates may have believed in the divinity of their king, they didn’t believe the palace’s story. Thirteen years on, interest has not waned. This week, yet another book was published further promoting the mystery with the underlying theory that if you can’t prove it and no one will admit to it, it must be right. Today, Nepal is struggling with political disarray, corruption and a booming population that wants its government to supply the basics of water, fuel and electricity. Many opinion makers hark back to the halcyon days of the monarchy as the pillar of Nepali identity and sovereignty, especially when India-phobia resurfaces. Yet, many handily forget that in a democracy, sovereignty is vested in the people, not in the divine right of kings. 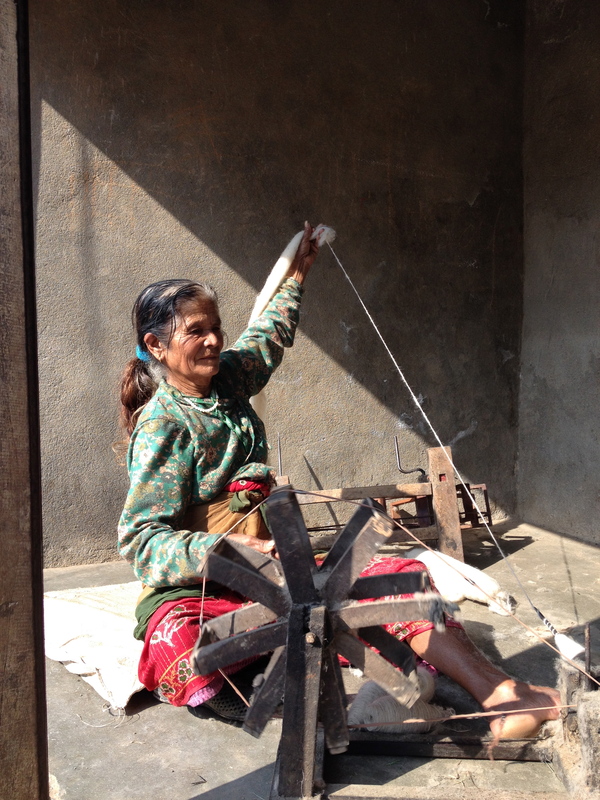 Democracy in Nepal has an enormously difficult legacy to overcome. The monarchy was in its last throws, a spent force, with poor leadership, a dysfunctional family that was disconnected from its desperately poor subjects and the growing Maoist uprising across the country. Yet all these conspiracies could help also a royal comeback. Nepal has come a long way from denying Dipendra’s role to posting signs to guide tourists to the royal massacre site. They now highlight the bullet holes in the concrete wall where Dipendra shot his brother. Nepali crowds flock to the palace, a once Forbidden City, where they can witness the lives of people they believed were gods. A high point is the map that details the locations where everyone was killed. Even so, the official four-page brochure handed out at the gate provides only two short sentences on the royal massacre. The most difficult legacy of the palace massacre may be that most Nepalis are left just with a myth, anecdotes, various story lines and the looming blue Genie of the RAW. Mothballs preserve the only history they can still see. This entry was posted in corruption, development, family, hinduism, India, international community, Kathmandu, King Birendra Bir Bikram Shah Dev, living overseas, Maoists, mass kilings, Nepal, RAW, religion, royal massacre, tourism and tagged Crown Prince Dipendra, Donatella Lorch, electricity, gods, Hinduism, Kathmandu, King Birendra, living overseas, mass killings, Narayanhiti Palace, Nepal, Nepal news, Queen Aishwarya, RAW, religion, royal massacre, south asia, tourism, war reporting, World on June 10, 2014 by Donatella Lorch. We didn’t ever see the actual massacre place right? We only went to the museum when I was there?